South Downs Planetarium - School Visits. An Exciting and Inspiring Place to Visit! We offer the excitement and wonder of a 'Big Sky Dome' not just a wide screen display, or temporary structure. Sitting inside our 11 metre dome you fully experience the dynamics of the heavens making comprehension and learning easy. It is like being outside on a fabulously clear, warm night filled with sparkling stars and planets. The effective teaching of astronomy involves viewing the night sky, but to take students "star-gazing" is often impractical for many reasons. A Planetarium brings the night sky to the students. It makes clear many of the basic aspects of astronomy and space science in an exciting and effective way. Children handling 4 billion year old meteorites. We focus mainly on learning and are available for school visits. The Presentations complement school studies in work for: National Curriculum Key Stages 1, 2, 3 and 4, GCSE Astronomy, General Studies, including Environmental Science, and Physics at GCSE, AS and A2 level. We provide a wide range of presentations for schoolchildren which both complements and supplements their National Curriculum work and meets the basic educational needs of a range of ages and abilities. Since opening in July 2001, the Planetarium has hosted visits by around 10,000 children of school age every year. Through its colourful displays, demonstrations and presentations in the main auditorium, young people are introduced to the awe and wonder of the universe around us and are inspired to want to learn more. The Planetarium is an educational charity managed and operated by a large team of volunteers and enthusiasts, who have a passion for science and education and believe that learning should be fun! This enthusiasm is clearly infectious because many of our school groups and individual visitors come back to us time and time again. These presentations meet the specific needs of university undergraduates, individual colleges and schools, including those from overseas as well as various adult and youth groups. Presentations can also be made to suit specific requirements. For example, for older students, topics such as life on other planets, the birth, life and death of stars, galaxies, the Big Bang and the expanding universe may be covered. Each presentation, given by an experienced lecturer, is of about 50 minutes' duration, followed by a question and answer session. The Children and I would like to say a huge thank you for having us on Monday. We had an amzing time. 'Great day supporting our 'Earth and Space' topic. Really happy with everything - a perfect trip. An outstanding experience for all of us. The staff at the Planetarium were a joy. Highly recommended to others. Our "Solar Trail ", runs along the 200 yards of approach road leading from the school roundabout in front of the Sixth Form Centre down to the Planetarium. The Solar Trail provides much needed lighting along the approach road utilizing 'full cut-off design' ensuring that there is minimal light pollution. Displayed on the lamp-posts at regular intervals are intersting facts about each of the planets in the Solar System. From the new Sports Centre, (named after Major Tim Peake, British astronaut), the trail starts with the dwarf planet Pluto and then in sequence points representing Neptune, Uranus, Saturn, Jupiter, Mars, Earth, Venus, Mercury and, finally, the Sun. Henry Adams and Partners, with technical advice and assistance from Gerry Davis. The Science Centre provides a highly adaptable multi-purpose space for use by visiting school groups and as a location for additional exhibits and hands-on activities during courses for adults and children. Its role is in exploring and educating not just Astronomy and Astrophysics but also other 'Earth Sciences' such as Geophysics Geomorphology and Meteorology. An extensive Astronomical Library. ... A Laboratory/Workshop ... An Information Technology Centre. The hall provides seating for over 60 people. As well as providing a secure and comfortable location for visitors to leave coats and bags and to eat lunch. It also include: Viewspace an internet-connected computer and large-format HD TV display to show the latest images, movies, animations and news from the Hubble Space Telescope, NASA spacecraft observatories. Multiple PC workstations These are used to study satellite images of weather patterns. Observing with robotic observatories. ... Various displays of our solar system and meteorites. There is a lot to be learnt at your leisure by studying the stunning 'Graphic Information Boards' in the entrance lobby. Souvenir gift shop The Gift Shop sells a range of low priced items such as pencils, notepads, postcards as well as a range of books from small pamphlets to more academic works. School visits can be booked with confidence. South Downs Planetarium complies with all the regulations and guidelines regarding 'Learning Outside the Classroom' and the New Government Guidance on Health and Safety on educational visits. Link to the New Government Guidance on Health and Safety on educational visits. Link to Learning Outside the Classroom. 01243 774400 . You can also send us an email on sdownsplanet@btconnect.com. , but do please provide us with a contact telephone number. We look forward to meeting you and your school group during the coming academic year. The cost of a Planetarium visit is £4.50 per child, teachers and helpers free of charge, but West Sussex LEA schools enjoy a discount of 50p per child on the normal admission price. We recognise that school visits must always be cost effective, especially so in the current economic climate, and need careful planning to achieve this. It may be, for example, that it is cheaper to use mini buses or parents' cars rather than to hire a large coach. Normally you will have the Planetarium to yourself but for smaller school groups it may be necessary to combine more than one into the same session, but we will always match age and ability. The auditorium can accommodate up to 96 adults/children, plus there are four additional spaces for wheelchairs. Some schools bring an entire year group at a time; larger schools may require more than one visit, while smaller schools bring two year groups at a time. Schools coming from some distance can bring a snack or packed lunch to eat during their visit, but please arrange and agree this with the Planetarium in advance. Every child will take home a colourful three-fold flyer commemorating their trip to the Planetarium, and a teachers' pack, list of helpful educational resources and an evaluation form will be given to the lead teacher of every group at the end of the visit. In addition, if your school is near to a bus route or railway station did you know that operators are willing and often able to make special arrangements to meet your needs? This might include running an additional vehicle on a scheduled bus route at a time agreed by prior arrangement. Such options may well be cheaper than coach hire. The following are the relevant contact details for the companies who will be pleased to discuss your specific requirements for group bookings on scheduled services. Please be sure to allow at least one month's notice ahead of your travel date. Most school visits last between two and three hours. A typical visit will include a show in the main auditorium followed by questions afterwards, plus a number of additional activities, which will be tailored to the requirements of the individual school, and the total time available for the visit. All shows have a live presenter, enabling plenty of interaction with the children. The name and address of our venue. Exactly what does your venue offer to educational visits? The South Downs Planetarium and Science Centre was established to provide a facility where people of all ages could learn about science in a very visual and exciting way. Since opening in July 2001, the Planetarium welcomes around 9,000 children of school age every year. In 2014/15 a total of 146 schools and colleges visited us. Through its colourful displays, demonstrations and presentations in the main auditorium, education room and foyer areas, young people of all ages are introduced to the awe and wonder of the universe around us and are inspired to want to learn more. The Planetarium is an educational charity managed and operated by a large team of volunteers and enthusiasts, who have a passion for science and education and believe that learning should be fun! This enthusiasm is clearly infectious because many of our school groups and individual visitors come back to us time and time again. Why we are a great place for educational visits? The effective teaching of astronomy involves viewing the night sky, but to take students "star-gazing" is often impractical for many reasons. We do have the Learning Outside the Classroom (LOtC) Quality Badge. The maximum group size that we can accommodate in the main auditorium is 96 students and accompanying adults, plus there are four additional spaces for wheelchairs. Some schools bring an entire year group at a time. Larger schools may require more than one visit on different days, or in two groups on the same day, while smaller schools often bring two year groups at a time. With small school groups (<30 students), we reserve the right to book in more than one group at the same time, but we will always ensure that the groups are of the same age and have the same learning objectives when sharing the venue. Our presentations complement school studies in work for the well-established National Curriculum Key Stages 1, 2, 3 and 4, the new International Primary Curriculum, GCSE and IGCSE Science, Edexcel GCSE Astronomy, General Studies, including environmental science, Physics at AS and A2 level, including the specialist Astrophysics Option at A2 level. Presentations can also be made to suit specific requirements, for different key stages or for different curriculum topics, or tailored to the needs of a specific group. For example, we have provided specialist subject-led presentations on the Arctic Sky, Landing on the Moon, Living and Working in Space, Mission to Mars and, for older students, topics such as life on other planets, the birth, life and death of stars, galaxies, the Big Bang and the expanding universe may be covered. Each presentation in the main auditorium, given by an experienced lecturer, is of about 50-60 minutes' duration, followed by a question and answer session. All shows have a live presenter, enabling plenty of interaction with the children. Most school visits last between two and three hours. A typical visit will include a show in the main auditorium with questions afterwards, plus a number of additional activities, which will be tailored to the requirements of the individual school, and the total time available for the visit. Schools coming from some distance can bring a snack or packed lunch to eat during their visit, but please arrange and agree this with the Planetarium in advance. Do you provide projects, teacher’s packs, work sheets or any useful information? We provide all visiting school groups with a teachers’ pack of useful educational resources and an evaluation form at the end of the visit. Students have the chance to take part in a fun quiz, based on the displays around the Planetarium, which will be tailored to the age of the visiting group. Are you happy for children to take photos, video or audio? In the foyer areas and the education room, visitors may take pictures or make video and audio recordings as they wish. While in the main auditorium, however, it is essential that all attendees allow their eyes to become accustomed to the dark. For this reason we ask that all mobile phones and iPads are turned off for the duration of the main presentation and flash photography is not permitted, but once the lights come up at the end of the show, students and teachers may take any pictures or video recording that they wish. What is your process for booking pre arranged risk assessments? We do not provide risk assessments for teachers, as every school’s requirements in this regard are slightly different, but teachers may book pre-arranged risk assessment visits at any mutually convenient time. Just call our General Manager, Andrew Copping, on 01243 774400 to make the necessary arrangements. The Planetarium has Public Liability Insurance with cover of up to £10 million. Does your venue have an Education Officer? The venue’s Education Officer is Dr John Mason MBE. What is the cost: of the visit? As of September 2017, the cost of a typical Planetarium visit is £4.50 per child, teachers and adult helpers free of charge, but West Sussex LEA schools enjoy a discount of 50p per child on the normal admission price. Specialist presentations for GCSE or A level students may incur a slightly higher per capita charge. Is specific clothing required for the trip? There is no special clothing required for the visit. Do you have first aid on site or will the group need to bring a qualified first aider? 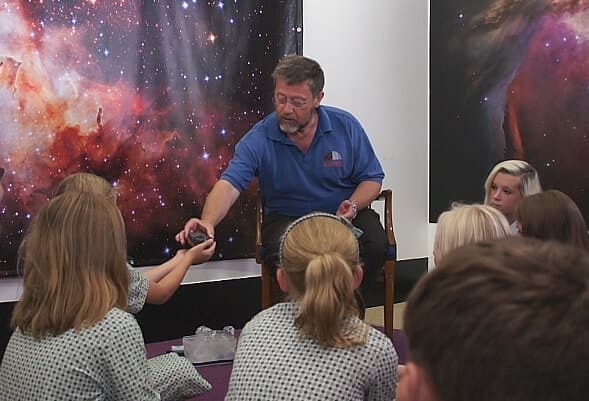 A number of the Planetarium volunteers are qualified first-aiders, but it is normal practice for every visiting school to have at least one qualified first-aider accompanying the visiting group. The Planetarium has adequate toilets for large visiting school group as well as separate facilities for the disabled. Complimentary tea and coffee is provided for all accompanying teachers and adult helpers. The Planetarium also has a vending machine selling canned cold drinks. There is also has a well-stocked sales kiosk selling a range of reasonably-priced educational items from 50p upwards. Groups using the sales kiosk typically bring about £3 to £5 of pocket money per child. We are also able to provide ‘goody bags’ for younger children from £1 per child by prior arrangement. It is possible for children to eat snacks and packed lunches in the education room, again by prior arrangement. There is also a secure, gated hard-surface playground area outside which visiting school groups may use under supervision by their teachers and at their own risk. What are your disabled facilities? The Planetarium has excellent facilities and easy access for disabled patrons. If you are wanting to bring more than four wheelchairs in one group, please let us know in advance, so we can make the necessary arrangements. The Planetarium is open for visits by school and college groups during normal school hours on any days during term-time, but ADVANCE BOOKING IS ESSENTIAL. We are particularly busy from October until March, so please do not leave it until the last minute to book your visit as we may be unable to accommodate you on the dates you want. The easiest way to book your Planetarium visit is to telephone us during office hours (10am to 4pm) on weekdays and ask to speak to our General Manager, Andrew Copping or Education Officer, Dr John Mason, who will also be able to answer any queries you may have. The Planetarium's telephone number is 01243 774400. You can also send us an email enquiry to sdownsplanet@btconnect.com, but do please provide us with a contact telephone number, as it is usually easier to sort out the finer details over the telephone rather than by email exchange. Is there anything else that you feel is important and want to include in your information? We recognise that school visits must always be cost effective, especially in the current economic climate, and that they need careful planning to achieve this. It may be for example that it is cheaper to use minibuses or parents' cars rather than to hire a large coach. In addition, if your school is near to a bus route or railway station did you know that operators are willing and often able to make special arrangements to meet your needs? This might include reserving seats together in a railway carriage or running an additional vehicle on a scheduled bus route at a time agreed by prior arrangement. Such options may well be cheaper than coach hire. The Planetarium is only a short walk from Chichester rail and bus stations.